4/3 Rumors - Fotodiox will launch a new Vizelex adapter soon. Higher quality and 0.5x reduction for MFT! 4/3 Rumors - Mitakon lens Turbo Ai to MFT adapter to be announced next week! 4/3 Rumors - EF to MFT Speed Booster coming in August. [updated] A while back there was a buzz about this new optical adapter from Metabones: the Speedbooster. This small and magical thing would increase the Field of View (FoV) (and thus decrease the effective crop factor) and sharpness of your lenses, as well as give you an extra F-stop of light. Recently I've seen a misuse of the brandname Speedbooster as a denomer to describe all of these optical adapters. Let's get this straight: these are called Focal Reducers. Update can be found at the bottom of this post. Let's look at how these optical adapters work. Below is a simple schematic (absolutely non-scientific!) 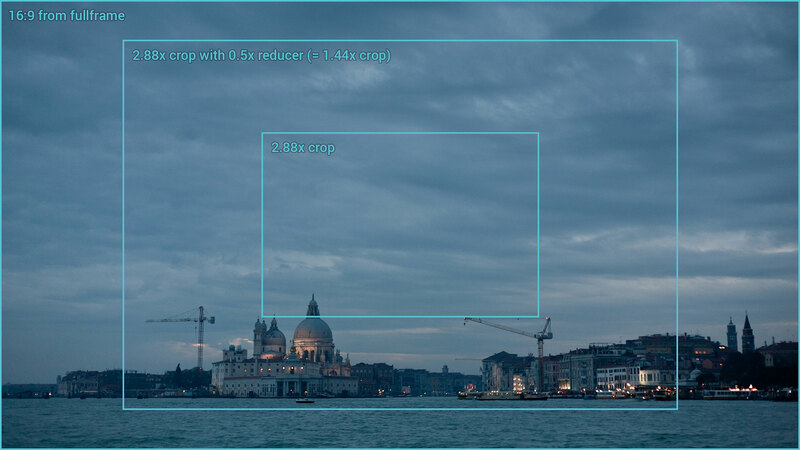 on what a crop sensor sees as compared to a fullframe sensor. The crop sensor area is marked in blue on the sensor and subject in the graphic. As you can see, there's a whole lot of image which is cropped away, and thus glass on the lens which is unused. This is where the focal reducer steps in. So what happens here? The focal reducer is placed between the lens and the sensor. It will take the light from a larger part of the lens than the crop sensor would use and compress it to fit a smaller sensor. So in effect - when you mount a (for example) 50mm f/1.8 lens (with fullframe coverage) to a 1.5x crop-sensor camera (for example a Sony NEX-5). 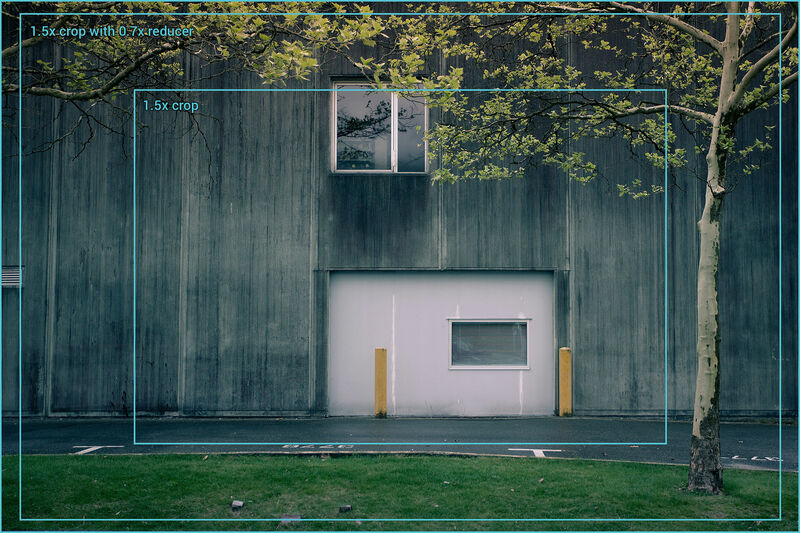 The crop factor increase the effective field of view to what would be a 75mm (1.5 x 50mm) on a fullframe camera. If you will mount this same lens via a focal reducer (let's take a 0.7x reducer for example) to the camera, the math would become 1.5 x 0.7 x 50mm, and the lens would have a reduced effective field of view of a ~53mm lens. Here's a sample (image courtesy of Casey Yee, creative commons) shot with a 50mm f/1.8 on a fullframe sensor. But there are more advantages. The fact that the focal reducer compresses more light onto a smaller surface means that there will be more available light. In effect, this will give you an extra stop of light with your lenses. So that same 50mm f/1.8 lens will now effectively be a ~53mm f/1.4 lens on our crop sensor. Nice. But there's even more. Because the light of the subject is compressed, the light beams are now packed more closely together - resulting in a sharper image. There's one condition to this, of course, the optical elements of the focal reducer have to be good. Price: $50, see notes below! Let's get this out: steer clear of the Fotodiox Vizelex Light Cannon Mk. I - this has been rebranded as a soft-focus adapter for a good reason. It's terrible optics. Fotodiox are (obviously) aware of this problem and will soon be releasing a completely redesigned new version of their focal reducer. In stead of simply destroying their stocks of Mk. I units, Fotodiox opted to rebrand them as soft focus adapters and sell them as such. A perfectly good way to minimize losses (and waste) in my opinion. I specifically mentioned the whole currently available detail because all the manufacturers will be releasing new models soon. To be more precise, all manufacturers are planning new Micro Four Thirds versions of their reducers. Metabones seem to be working on a M4/3 version of their Speedbooster. It will most likely have a reducing factor of 0.71x and will add one stop to the lens speed, just like their current line-up. Their Canon to M4/3 version is even said to be an active adapter. That would be an industry first! Active control of Canon EF lenses on the Micro Four Thirds system, something that was up until now only possible using external controllers like the Redrock Micro Live Lens MFT Active Lens Mount. Mitakon is also said to be releasing a M4/3 version of their Zhongyi Lens Turbo. This will be a passive adapter, and have a reducing factor of 0.726x and it will add one stop to the lens speed. Fotodiox are about to do something (even) more interesting. After their initial problems with the Vizelex Light Cannon, they are climbing back into the saddle and will most likely be releasing two new Mk. II adapters for M4/3. One with a reducing factor of 0.7x which will add one stop, and a 0.5x reducer which will add two stops to your lenses. The very last one I mentioned is the one which got my attention. A 0.5x focal reducer would mean that the Blackmagic Pocket Cinema Camera (BMPCC), which has a crop factor of 2.88x, would end up with a reduced crop factor of 1.44x - which is around the same size as Super35. A Super 35mm CinemaDNG RAW recording camera which (after adding the required lens and focal reducer) will fit in a small bag, or purse even. Below I've posted an image (courtesy of Michele Solmi, creative commons). This is a 16:9 image from a fullframe still shot with a 50mm at f/2.5 - to illustrate what the 0.5x focal reducer would do for the BMPCC. Metabones surprised us all (well, most of us anyway) with the announcement of their new special Metabones Speed Boosters for the Blackmagic Pocket Cinema Camera and Cinema Camera 2.5K. Read all about it right here. Mitakon Lens Turbo does work on the BMPCC! Mitakon Lens Turbo does not work on the BMPCC! Others have left 11 comments so far. Tap/click a comment to reply to that comment. Waiting for Metabones to release a different model to their existing EF-NEX Speed booster that would allow the Canon EF 50mm 1.0 L to actually have a relative aperture of f0.7 instead of being capped at f0.90 :-( Forums sites have already discussed this issue and it is a technical reality requiring slightly larger glasses. Now to convince Metabones that the several thousands of EF50/1.0L owners out there are actually interested to own a Zeiss 50/0.7 equivalent!! any speed boosters for olympus om/sony e-mount cameras? i submitted enquiry about olympus om lens/sony e-mount camera focal reducer/speed booster (or turbo booster). Was wondering if you ever resolved your problem with finding a reasonably valued booster going from OM (old Zuiko lenses) to Sony Nex cameras? If I may ask, is there any test data or experience as regards the Camdiox (mainly sold from Ireland through eBay for about 70 quid) Focal Reducer Speed Booster Adapter? I'm not aware of any tests of the focal reducer you mentioned. But I'm also not familiar with it. I looked it up on YouTube, and the footage looks alright - maybe slightly on the soft side - but very usable. The footage 'feels right', as far as I'm concerned. And at 70 quid, you can't really expect Metabones levels of sharpness and crispness. It's a matter of taste and 'good enough'-level you can accept. I should update the post on my site concerning the one I got from eBay. It was good for a long while, but somehow the optics have gone misaligned and its now just more of a pain than profit. Does an EOS to EOS speed booster/focal reducer exist?